There have been some recent developments in Advisory Neighborhood Commission (ANC) 5D that merit highlighting as they impact the Trinidad neighborhood. Two of three ANC Commissioners in Trinidad are being recalled along with one Commissioner from Carver Langston. TNA cannot set forth an opinion unless there is a vote of paid members or a special meeting organized and properly noticed at least 7 days in advance to discuss the issues. While TNA cannot weigh in on merits of the allegations, there is concern that if the recalls are successful Trinidad will be lacking representation for an undetermined amount of time. Residents should be aware of the process initiated and underway as well as consider potential impact of gaps in elected leadership. For additional information on ANC meetings, you can listen to audio of most recent meetings online. Some meetings are also on YouTube or on blogs or Twitter feeds (#ANC5D). The DC Board of Elections has detailed information on the recall process. You can view that site here for information. Specifics on the three recall petitions are briefly outlined below. 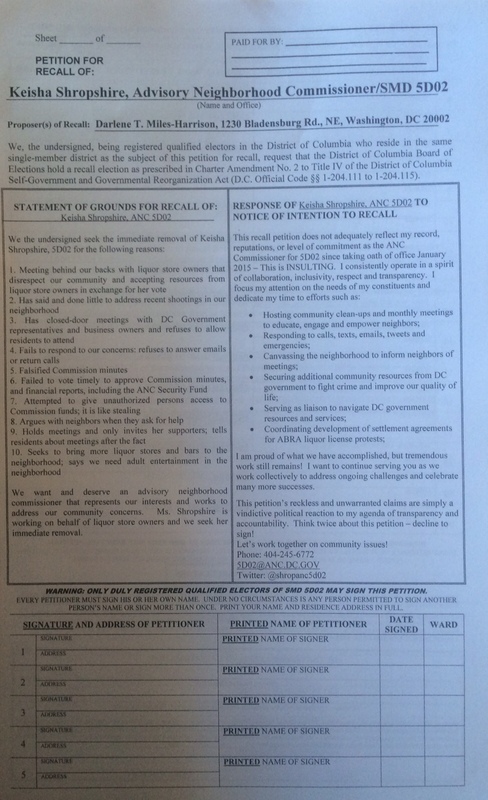 On July 10th, George “Action” Jackson, resident and candidate in the last election, filed paperwork with DCBOEE to recall ANC 5D06 Commissioner Yvonne Buggs and resident Steve Motley filed paperwork to recall ANC 5D03 Commissioner Adam Roberts. On July 16th, Darlene Miles Harrison, resident and candidate in the last election, filed paperwork to recall ANC 5D02 Commissioner Keisha Shropshire. Each Commissioner was served with a notice of intent to recall letter from DCBOEE with the petitioners’ statement of reasons for the recall. The elected officials were then given opportunity to prepare a written response of 200 words. In their August 5th meeting (agenda at nr_1739), DCBOEE reviewed all three petitions and responses. As there were no changes to the statements provided by petitioners or Commissioners, the board approved the draft petitions as final for circulation (see below for copies). DCBOEE does not investigate allegations in the notice of intent to recall; they simply verify that what was submitted to them is included in entirety on the petition to be circulated. 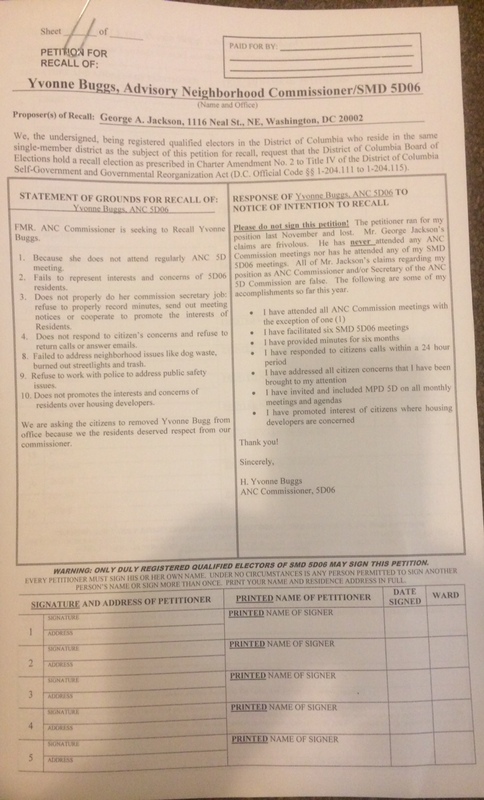 Once approved, the petitioners were to make double side copies that have both statements affixed on page one*. They can then begin collecting signatures from 10% of the registered voters in the Single Member District (SMD). The numbers established by DCBOEE, based on registered voters at a given date just prior to the date the petitions were submitted, are 181 signatures in ANC 5D06, 166 signatures in ANC 5D03, and 160 signatures in ANC 5D02. All petitions are to be returned to DCBOEE on October 5, 2015. If all signatures are validated by DCBOEE, there will be a special election called in each SMD to vote for/against a recall of the Commissioner previously elected. If successful in the recall election, there will not be representation at the ANC level in those SMDs until such time as another special election is held and a new candidate duly elected and sworn in. In this scenario, the seven person ANC 5D would be reduced to four with only one representative from Trinidad. That would impact Alcohol Beverage Regulation Administration (ABRA) protests; work with the Bureau of Zoning Adjustment (BZA) on variances and special exceptions, including for those residents that need to seek exception; and resident input on traffic, parking, recreation, street improvements, economic development, police protection, sanitation and trash collection, and the District’s annual budget. These are areas where the ANC is given weight on policies and procedures. (See http://anc.dc.gov/page/about-anc for information on the role of the ANC). Again, the intent of this posting is to be informative and provide links for additional information but not express an opinion or discuss allegations made by petitioners. DC residents were given right to recall any elected official in 1979 with passage of the Initiative, Referendum, and Recall Procedures Act. If you have questions or concerns about this process, please contact the Office of the ANC, DCBOEE, a Councilmember, your Commissioner, or other elected official. 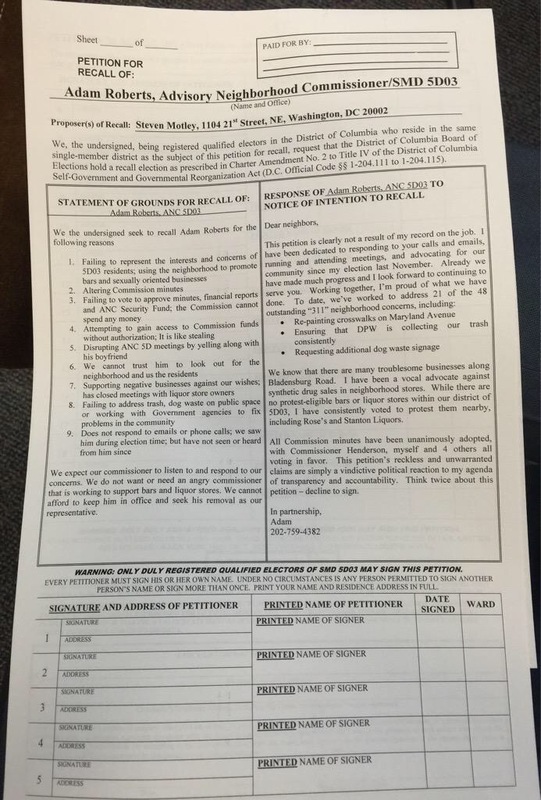 * A DCBOEE staff person did make those copies for 2 of the 3 petitioners in the DCBOEE offices, which may or may not be permitted by DCBOEE procedures. Posted on August 6, 2015, in ANC-5D and tagged ANC-5D, recall election. Bookmark the permalink. 2 Comments.